We offer carry-out options for most of our items on our menu! For more information or questions, please call us at 410-956-2995. Adam’s homemade beer battered jumbo onion rings fried golden brown. Served with our special loaf sauce. Fresh corn tortilla chips served with queso and salsa. Carrots, celery, cucumbers, broccoli, and grape tomatoes, served with ranch dip. Served with cocktail sauce. Try them “Baltimore Style” – steamed with onions. 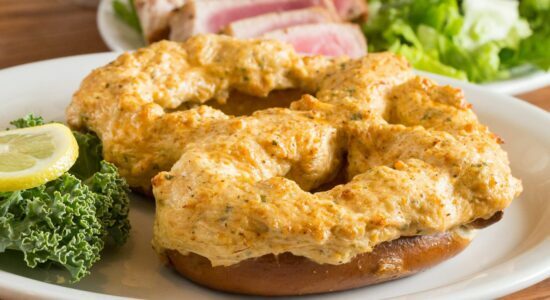 A creamy blend of cheese and spice baked perfectly. Served with sliced baguettes. Thinly sliced Philly steak over fresh tortilla chips, served with shredded lettuce, diced tomatoes, jalapenos, cheddar cheese and a tangy BBQ sauce. (4) potato skins topped with bacon & cheddar cheese, served with sour cream. Our homemade crab dip served over an oven baked pretzel. Our homemade chili blended with our nacho cheese, served with fresh corn tortilla chips. Thinly sliced ahi tuna seared rare, served with a side of wasabi sauce. All Adam’s Wings are made fresh and served with bleu cheese & celery. (8) plump and juicy wings breaded and fried. Buffalo Style or Honey BBQ. 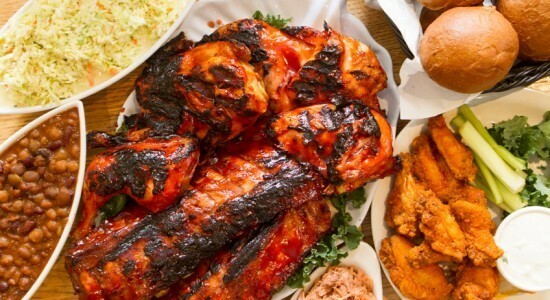 (8) wings baked, simmered in beer and spices, then grilled in our famous hot sauce. 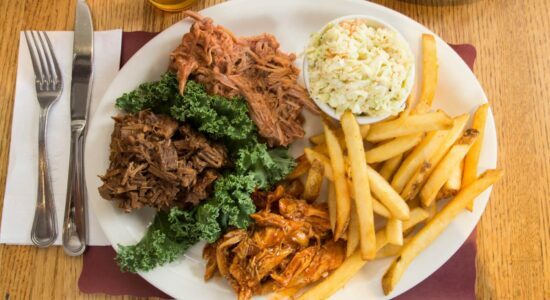 Three grilled portions of bone-in pork from the shank end of a fresh ham, served with your choice of Buffalo Style or Honey BBQ. 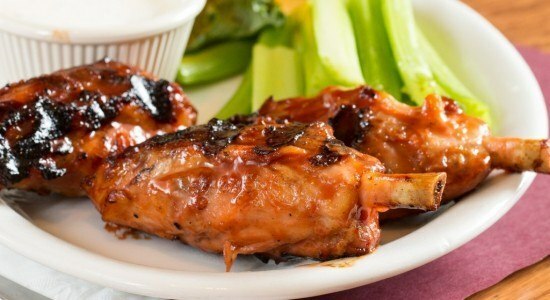 (10) boneless chicken wings served Buffalo style or with Honey BBQ sauce. All of our soups are made on the premises using only the finest ingredients. Mixed greens with cucumber, tomatoes, carrots and red onions. Crisp romaine tossed with grated Parmesan and croutons. 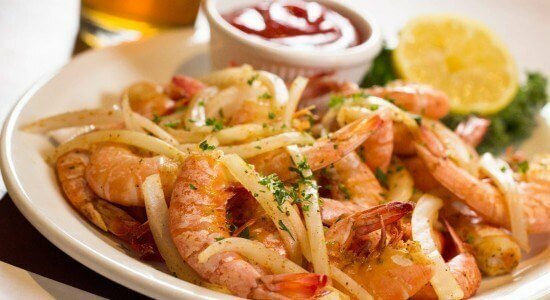 Sautéed shrimp in scampi butter, served over a large garden salad or Caesar salad. 6 oz. Ahi tuna steak grilled with a lemon herb butter, served over garden salad or Caesar salad. 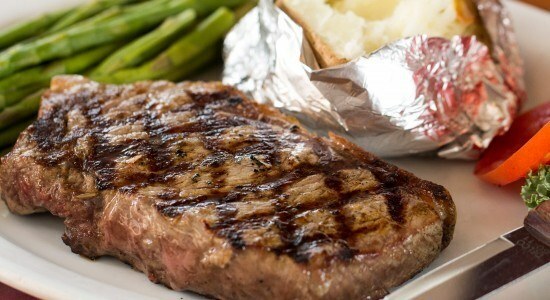 Slices of tender New York strip steak served over your choice of a large garden salad with balsamic vinaigrette and Parmesan cheese or a Caesar salad. Served over a garden salad or a Caesar salad. 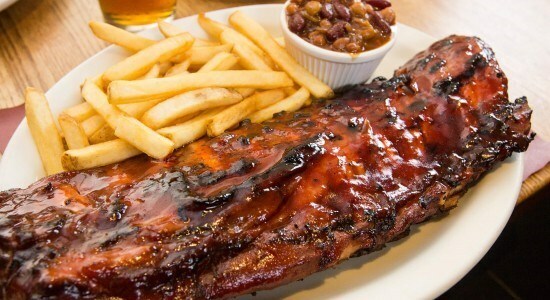 Our famous, mouth-watering, tender ribs. This is why you came here! 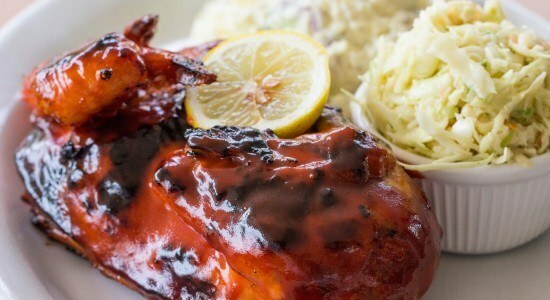 A slow cooked half chicken basted in our famous sauce. Perfectly charred half rack of ribs & a slow-cooked half chicken. Tender & moist, basted in your choice of our house sauces: BBQ OR Mediterranean. Nine skewered jumbo shrimp, wrapped in bacon. Three BBQ’d jumbo shrimp & a half rack of ribs. Three BBQ’d jumbo shrimp & a half BBQ’d chicken. Half pound of ribs, 5 oz. crab cake, 3 Jumbo fried shrimp. Boneless 8 oz. 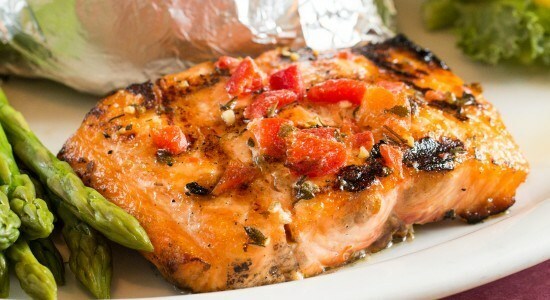 cut grilled in your choice of BBQ sauce, Mediterranean or Bourbon style! 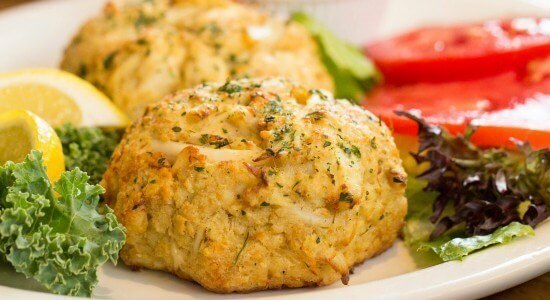 Perfectly seasoned Jumbo lump crab cakes broiled or fried until golden. 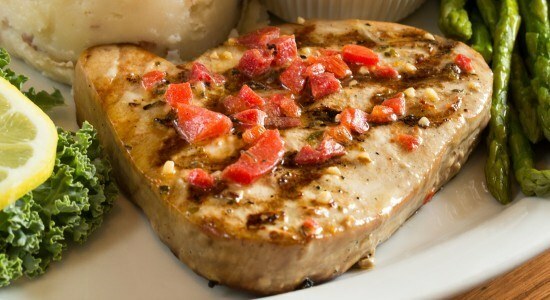 Tuna steak grilled & served with lemon herb butter. Grilled to medium unless specified. Adam’s Signature Sirloin Steak grilled to your liking. Fresh Atlantic fillet grilled & served with your choice of sauce: Mediterranean, Lemon Herb Butter or Bourbon Sauce. 10 Large gulf shrimp hand-breaded & fried to golden brown. Served with cocktail sauce. 9 Large oysters hand-breaded & fried to golden brown. Served with cocktail sauce. Half rack of baby back ribs served with a Maryland crab cake. 8 oz. entree portion. Rubbed and Smoked then drizzled with our tangy Bourbon smoke sauce. Served with fries and slaw. Substitutions will be charged at a la carte price. 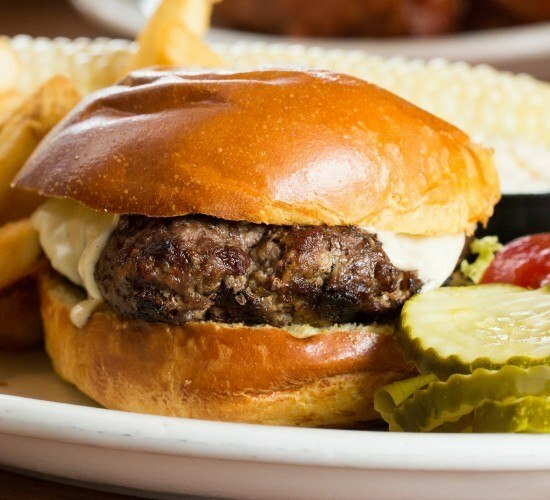 A half-pound of fresh, hand-patted ground chuck, grilled to your liking and served on a roll. 6 oz. of our strip steak char-grilled to your liking with sautéed onions, mush- rooms and provolone cheese. Served on a baguette with lettuce, tomato, pickle and mayonnaise on the side. 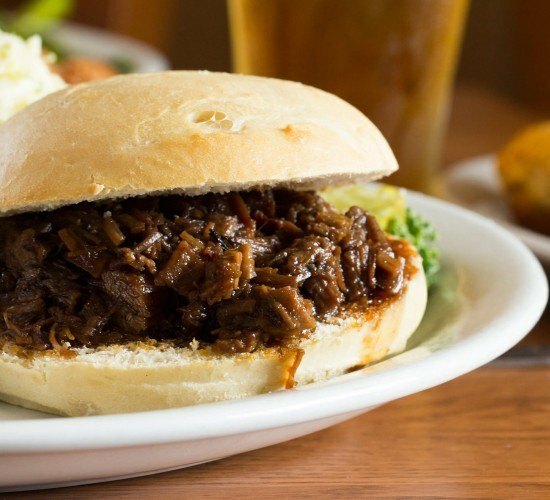 Tender braised pork pulled from the bone, chopped and piled high on a French round roll with Adam’s BBQ sauce. Served with sautéed onions, mushrooms and provolone cheese. 6 oz. Ahi tuna steak grilled with a lemon herb butter, served on a roll. Dolphin safe. Breaded & fried dipped in Adam’s spicy wing sauce & served on a roll with bleu cheese dressing.